Signalling a new look and silhouette, the Croatian-born designer yesterday launched a look that was different from last season's fluid and draped silks. Focused on a monochrome palette, Doma showed black tailoring and white shirts, which all came in different lengths. The trousers were often of a cigar shape and the shoes came with a substantial sole, giving the models extra height. Knitted leggings - full length and as a shorts added the a more structured and square aesthetic. Leather was prominent but what also stuck out was the vertically quilted jackets and coats. One of the stronger pieces also included a sleeveless knitted leather top, almost looking like mail armour. Dazed Digital: What was the general idea behind the collection? Damir Doma: It was to create a new silhouette out of what Damir Doma used to be, and to basically lift it up, as you saw with the shoes. They were height focused and the idea was to almost make sculptures out of the models, to lift them up and to give the trousers volume and space to breath. Damir Doma: Yes I was sort of introducing the white shirt into the brand. It was structured and about proportions, about different kinds of length. 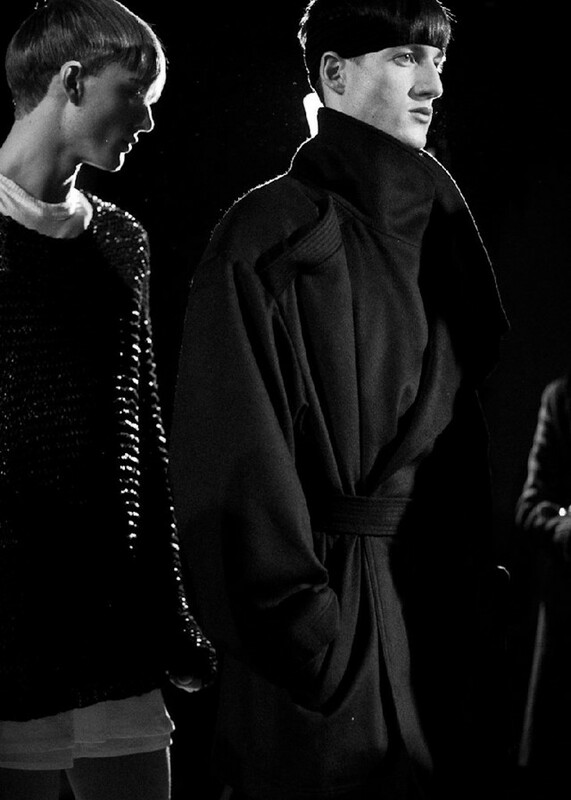 Damir Doma: It's a new direction and I wanted to be focused on the proportions and the materials. This was the first step and next I will introduce colour. DD: Was that a long slim tie we saw? Damir Doma: Yes it was my tie version, it's basically a really long pieces of fabric that you button in, we wanted to keep it super clean. Damir Doma: They were quilted leather, and it worked with structure idea - we also had knitted leather tops. There's always so much fluid fabrics in my collections so this time I wanted boxy shapes. Damir Doma: The new kind of tailored collar less pieces and the knitted leather tops.